View a great slideshow of antique cast iron stoves. From antique architectural salvage yards to online auctions, antique heat registers are highly sought after for their beautiful metalwork and period designs. Placed in the floor or on the wall, a heat register allows, or stops, the flow of hot air carried through the duct work from the furnace to enter a room. The air flow control is called a louver or a damper. If the louver is in the open position, the warm air is permitted to flow through. If the louver is in the closed position, the air is stopped from entering the room. Although most antique and vintage heat registers were made with a louver, there were also many made without the air flow control. Circular designs - A gorgeous circular design makes this reproduction register grate a beautiful piece. Craftsman - Baseboard registers from the Craftsmen era are charming in their simplistic design. Authentic reproductions are offered from Mission Metalworks in standard grid design or the beautiful cathedral design. Arts and Crafts - Floor heat registers often featured basic shapes and patterns during the arts and crafts movement. 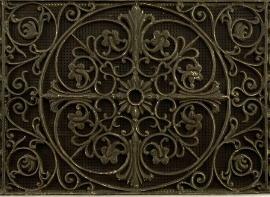 Opera grilles - These are the wall heat register grates that were used in the late 1800s in Victorian opera houses. The exquisite heat registers have very ornate scroll work and detailed designs. Reproductions of these elegant pieces are offered at Opera Grilles. Victorian sunburst - A magnificent Victorian sunburst design heat register is offered by Columbus Architectural Salvage. Antique heat registers are wonderful examples of the lovely metalwork of utilitarian objects from years past.